SU Carbs - Connection, HIF type. Although there are a number of different versions of the HIF type carb, they all essentially share the same type of connection layout. The diagram below depicts the most common type - the connections can be on either the right hand side (as illustrated below) or the left hand side. Some have the connections shared on either side. Whichever, the port functions are the same. It isn't essential the crankcase breather pipe be connected - you really don't want that choking crap from the crankcase spoiling your nice, fresh, fuel-rich incoming mixture - but it's obviously essential to block the port off if you don't. A blob of RTV Silicone is sufficient in most cases. To adjuster mixture - screw the adjuster in to richen, out to weaken. There may be a 'anti-tampering' cap in there on some carbs - just hook it out. 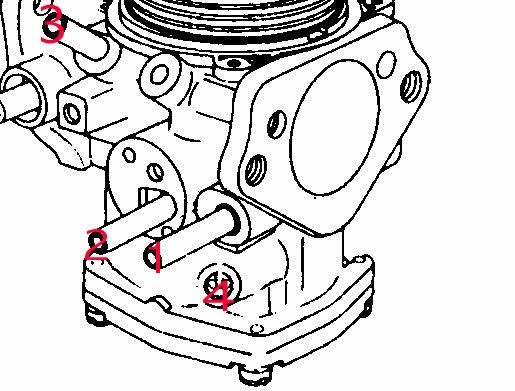 On some HIF carbs - predominantly used on later Ital (Marina) and Maestro A+ low compression engines - there can be a black hose looped from a port on top of the carb to manifold flange to the float chamber breather/overflow port. This is a leaning-out device for when running at cruising speed on small throttle openings. This needs removing before it's really useful on tuned Minis. Just block the flange-mounted port off, and breath the float chamber to atmosphere as normal. Unlike the H and HS type carbs, the choke circuit is controlled internally by a special port controlled by a tapered spindle - so there's no messing about with choke linkages needed. Simply connect the cable up. The standard Mini mechanical fuel pump is more than enough to feed the 1.75" HIF carb up to about 115-120bhp. Outputs higher than this that are to be used at maximum power/rpm for any length of time, it's advisable to think about fitting an electrical pump to ensure constant delivery at max power/high engine speeds. Required pressure is 2.7-3.0psi with a flow-rate in the order of 15-18 gallons per hour. And unless the car is being driven flat out all the time - a pressure regulator is highly advisable to avoid rough-running at idle (caused by over-rich mixture as the carb is shaken about) and flow valve seat damage. Using pumps that produce higher pressures and flow-rates than this are purely over-kill and will make a regulator an absolute necessity. Get a good quality one as it'll be earning it's living!